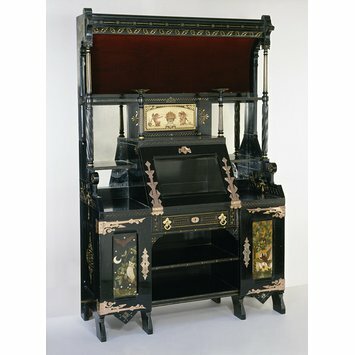 This cabinet was made at about the time of the Philadelphia Centennial exhibition of 1876 in which Kimbel and Cabus exhibited an entire drawing room, complete with fittings and furniture of ebonised cherry. The cabinet is architecturally inspired and is typical of Kimbel & Cabus's 'modern Gothic' style of furniture, also known in America as 'Eastlake' after the English design pundit Charles Eastlake (1836-1906). The incised linear decoration and geometric patterns can be found on almost every one of their cabinets, and the incised and coppered brass hinges are also very typical of their work. 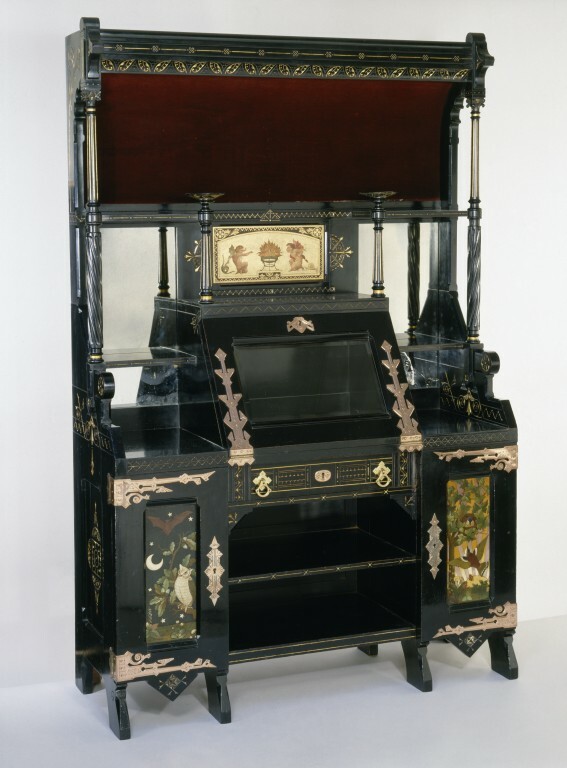 This cabinet features an inset painted and gilded panel of two cupids, but set-in tiles made by the Minton-Hollins company of England and marquetry panels were often used on such cabinets instead. Embellishments, such as tiles or painted panels, were frequently added to British furniture of the time but were rarely used on American pieces. In the late 1980s the cabinet was displayed in the gallery of Art and Design in Europe and America 1800-1900, where it supported a bust of Mephistopheles by the Russian sculptor Mark Antokolski (A.9-1982). Kimbel & Cabus exhibited an entire drawing room at the Philadelphia Centennial Exhibition of 1876, complete with fittings and furniture of ebonised cherry. This cabinet is typical of their 'modern Gothic' style of furniture. The style is also known in America as 'Eastlake', after the English writer Charles Eastlake, whose Hints on Household Tastewas published in America in 1872.